Naandi Foundation has been working in the Araku valley for more than 20 years. It has developed “the Araku way”, a holistic approach to development with a family-centric point of view rather than just farming and livelihoods. In 2010, the Livelihoods Carbon Fund and Naandi initiated the planting of 6 million trees, including 3 million coffee trees. Naandi and the Livelihoods Carbon Fund have joined forces again to implement a landscape project with 40,000 women and men Adivasi farmers. Anupama Sreeramaneni, Director of Operations, and David Hogg, Chief Agriculture Advisor at Naandi, describe the journey that has led to the Livelihoods-Araku #2 project and the consistency of this integrated project covering 18,000 ha. Anupama has been working at The Naandi Foundation for 8 years. She manages a core team of 5 people who will implement the Livelihoods-Araku #2 project, after having successfully deployed the first project which planted 6 million trees. Engineer by education, Anupama has worked in IT and health insurance companies in the United States before coming back to India and engaging with the Naandi Foundation. She brings her engineering skills to implement systems which bring all the components of the Livelihoods-Araku projects to life on the ground. Moreover, as she has grown and studied in Visakhapatnam, the largest city of Andhra Pradesh district where the Araku Valley is located, she speaks Telegu, the local language, and has thus been able to build strong bonds with the field staff and the Adivasis. David was born in New Zealand where he studied history and law. At the age of 20, he left everything to fly to India and work in agriculture. He started as a coffee consultant for Naandi in 2004. He applied regenerative agriculture techniques to coffee and trained the resource people of the Naandi Foundation so that they could in turn train the farmers. David nurtured all his work with cultural elements to develop an agriculture which is essentially Indian. In 2009, he joined Naandi full-time as Chief Agriculture Advisor. His goal ever since has been to introduce a culture of sustainability that allows farmers to become more prosperous and to attract more youth back to agriculture. He focusses his work on making Araku farmers understand agriculture as a lifestyle and not only as a way of making a living. Livelihoods Venture: Within, the first Livelihoods-Araku project, 6 million trees were planted by 25,000 women and men farmers in only 5 years. How did you manage such a large-scale project? David Hogg: One of Naandi’s expertise is to bring communities together. We started working in the Araku Valley around 20 years ago with health care as mother and child mortality were at an alarming rate. That was the first connection with the community. Then we brought in education for girls who had always been left aside. We knew that we had to find ways to improve farmers’ revenues for them to be able to send their children to school. So, we started to get into agriculture. The Adivasis had a long tradition of farming, for their millets for example, but there was no tradition of horticulture. For them, the trees were the forest and Nature took care of it. We had to introduce the idea of looking after the trees. By working with the community, getting rid of the money lenders who were taking high interest rates and traders taking the goods from the farmers, we slowly got their trust. It was all those years working with the communities that enable us to do what we do now. Chief Agriculture Advisor at the Naandi Foundation. Anupama Sreeramaneni: Trust and planning were at the heart of the project as we had a 15-day window per year to plant millions of trees. In the Araku Valley, all the agriculture depends on the rains and the monsoons. We need to plant at the beginning of the monsoon so that the trees get rooted and continue to grow until the next monsoon. The monsoon season starts in June and ends by October`. Whatever the number of trees we have to plant, we have the same 15-day window to do it. So, we prepared everything during 11 months and we had one month of operations with 2 weeks of planting. We mobilized up to 25,000 women and men farmers for the planting campaign. They also took care of the saplings and now do the maintenance. So, we needed a real commitment from the farmers. After the first project with the Livelihoods Carbon Fund, we planted 5 million more trees with the support of the Mahindra group. Our strong relationship with the Adivasis makes this large-scale programme possible. Director of operations at the Naandi Foundation. L.V. : What were the main challenges Naandi had to overcome in the first Livelihoods-Araku project? A.S.: One of the key challenges was to ensure that the right information got to the villagers on time. 95% of the villages we are working with do not have any mobile connectivity. Yet, we had to make sure farmers knew when the monsoon was coming, when the saplings would arrive and how to plant them according to the planting plan to respect distances between trees and allocate the 13 species of fruit trees. We did that through the strong ties of the Adivasi community. Information was passed on through word of mouth. And it worked! Furthermore, the farmers were at first very apprehensive of weighing machines and of the price they received for their coffee. They were not aware of the market price and had no means to get access to market information. They were dependent on the middle men. Over the years, Naandi has built a credibility. We provide them with information on commodity prices and we have been very transparent since the beginning. D.H.: In coffee, the challenge was quality. To get a premium quality coffee, the cherries had to be harvested at the right time. Before the project, once a cherry was red and even if the others were not, the farmers harvested everything at once. The cherries were then dried by a middleman and there was no quality at all. We knew that the only way for Araku Coffee to survive was to make it a premium coffee. We had to make sure the cherries were picked at the right moment. We have a very decentralized system with a centralized process. We had to convey to the farmers when a cherry was red enough to make premium coffee and we used to joke about the 50 shades of red. And the magic happened when the cherries were picked at the perfect time and when the trucks were there to get them when needed. Every stage from the farm to the cooperative was crucial for excellence and the genius of Anupama and her team was to operationalize this quality process. L.V. 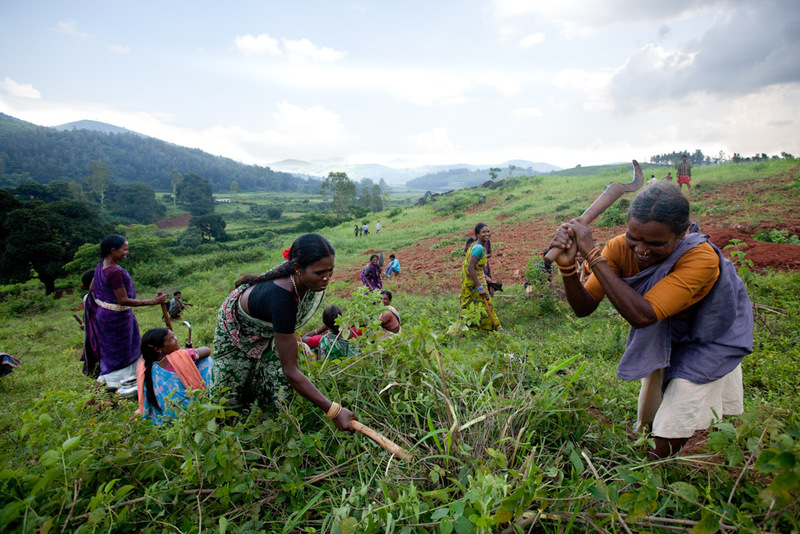 : The Livelihoods-Araku #2 project aims at improving the lives of 40,000 women and men farmers and restoring 18,000 ha. What’s new with this project? D.H.: The first Livelihoods-Araku project focused on tree planting. In the Livelihoods-Araku #2 project, we will work on a multiple activity platform. We will bring sustainable agricultural practices in coffee production, but also millets, legumes and pulses cultivation, fuel forests, cattle fodder and tree planting. We are going to have plenty of activities for each: mulching, composting, green manuring, crop rotation, live fencing, seed selection, etc. It is going to be much more intense this time. We are virtually going to be living in each farmer’s backyard as we need to be connected to them on a daily basis. The Livelihoods-Araku #2 project is already spinning my head with new opportunities. For example, as we will work on millets, we will be able to encourage the farmers to have kitchen gardens and introduce a whole narrative on nutrition. A.S.: This project will require more training and more documentation. For example, we will have to explain why fodder production is as important as coffee which is a cash crop and we will have to make sure that the farmers are working on all the types of systems. The thorough monitoring of the Sustainable Agriculture and Land Management Practices (SALM) becomes imperative because they are the key to measuring the impact of the project. The success of the monitoring and timely data will depend on 3 levers: training, process and technology. We will train young men and women to document and monitor the project. We will build processes that can be effective on a 20-year basis, the duration of the project. Farmers will move in and out of the project all along and we need to guarantee a continuity in the monitoring process. Last but not least, we plan to use technology to make the monitoring as simple and as visual as possible. This will be a real challenge in an area with little connectivity. L.V. : Why do you think this landscape approach in the Livelihoods-Araku #2 project will be successful? A.S.: I am confident because this landscape approach fills a huge need for the Araku farmers who don’t have access to sustainable farming techniques and are very eager to learn. We have to ensure that the farmers are committed. And it will come only when they see the project is delivering benefits on their income and that their children are going to school. The Adivasis are proud of being farmers and we must make sure that the youth continues to be proud of agriculture. This is the only way to mitigate migration to urban areas. Moreover, there is an overall homogeneity in the valley. The villagers consider themselves as the Adivasis, the first inhabitants of India. Only a tribal can own land where we work. There is therefore no land speculation, and this is a key success factor for the landscape approach. D.H.: The SALM practices will bring a systematized agriculture rather than organic farming by default. Rather than ‘plant, forget and pray’, we will implement a science of agriculture. We will build on the learnings of the Livelihoods-Mount Elgon project in Kenya which has already delivered conclusive results. By adding more carbon to the soil, through composting, green manuring, etc., it will become more and more fertile. Farmers will get more revenues and in a couple of years, they should be able to do their crops while being less reliant on rains as the soil will retain more moisture. And the beauty of all this is that the companies that have invested in the Livelihoods Carbon Fund will get carbon credits according to the increase in the soil’s fertility. With this 20-year project, we are able to strategize a long-term agricultural system while delivering short-term results and it makes it very exciting. Photos : Hellio-Vaningen/ Livelihoods Funds; David Hogg; The Naandi Foundation.